There are times when I think I know quite a lot about horses, and then other mornings I wake up and realise there is still so much more to learn. Animals behaviour is so complex, it's never a simple situation of leaders and followers, dominant & submissive, predator and prey. The more you watch, especially animals that have strong ties to a natural life the more you learn their societies are far more complex than we ever give them credit for. The basic explanation of horse society is that in there is a herd stallion, a lead mare and then the rest submissive under these two. The stallion chases off other male competitors, protects his herd, while the mare leads the herd to grazing and water and always eats and drinks first. But there is much more to horses than this, a lot of behaviours have been lost or changed in our domestic horses because of their artificial environment. To me it always fascinating to get a glimpse into wild behaviour when watching my own domesticated but once wild horses. One thing that has always stood out to me, is the procedure for accepting new horses into the group or herd. If your a horse person and have watched a new horse be introduced to a paddock of other horses. You'll know the scene of galloping around tails in the air, the rushing to meet the new stranger, and the high spirited sometime idiotic behaviour they exhibit. Kicking, squealing, galloping and bucking as they all sniff noses and meet each other, while you kinda watch cringing hoping no one gets hurt. This doesn't happen at my place anymore. I have always noticed that with the wild horses especially the older ones the introduction process whether stallion or mare is very different. Fern, my wild mare, in almost all situation is the calmest most docile of equines, and not what you think of when you picture an alpha mare. Having been with me for three years it has been fascinating to watch her behaviour and interactions with domestic horses. From being the new horse introduced to a herd. To now being the leader of our little mare herd of six. I have never seen her gallop up to greet a new horse. In fact she keeps her herd well away and any new rude individual that just assumes it can join she chases relentlessly until they maintain a healthy distance. She will chase them away off for days if they attempt to sneak into the group of horses, which they do frequently, and will make them move them off until they learn that when she's moves they must obey immediately. Over the next days the new horse is slowly allowed to come closer and then join in the mob. Even when introduced herself she stayed well away and only joined the domestic horses in grazing together after many weeks. With a foal at foot and introducing her back into her paddock full of friends the same process was repeated. She kept Sonny her foal, away from the others always positioning herself between him and the herd for weeks before slowly allowing him and herself to ease back into herd life. This method makes sense, it ensures Fern and her offspring stay safe and elimates any violence during meeting new horses. It also ensures that any horse that joins the group already knows it position and does not show aggressive or dominant behaviour. All in all it keeps the herd as a hole running smoothly and calmly as even the horses within the herd are not allowed to go galloping off to meet any newcomers. The reason behind writing all this down is recently reading about wildlife conservation in Africa, and how important it is to introduce animals slowly. The book highlighted the inceribly complex social structure of Rhinos, a species that is commonly thought of to be fairly stupid and loners, and the huge failures of early rhino rehabilitation. When poeple not understanding this just dumped new rhinos into areas with other rhino established, continuously leading to the deaths of those introduced. Animals are complex. What may seem stupid beahviour to us may be innfact an integral part of their survial. I used to think Fern was just like the lone rhino when she first arrived,and could never understand why as a 'herd' animals she never wanted to be with other horses, but she is the ultimate social creature, she just knows how to run things the way they are meant to be. I could go on and on about examples of the complex equine behaviour I watched under Ferns herd management. How even extremely herd bound panicky ex-race horses have to go through her rules of isolation, but come out the otherside mentally stable independent 'normal' equines. I'm lucky that I can still run my horses in small groups and large paddocks and they have a great existence as close to natural as domestication can be. It gives me valuable oppurtunity to continue to watch and learn and realise how smart these animals are, and how much more their is to learn. 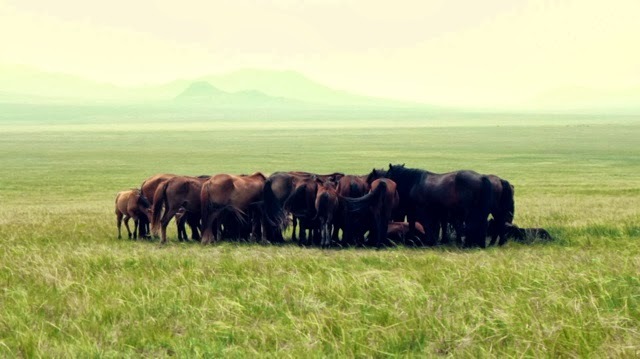 I'm incredibly lucky to have been to Mongolia and got to ride through vast herds of horses on open steppes that live as close to wild as you can get. The lesson I learned there have opened my eyes to so much more, and truly showed me how different our domestic animals have become. But you do have to look for that knowledge and sometimes it's in what you do not see.....but that will have to be for another day and another blog post.